The Glenholm Centre is a family business owned and managed by Neil Robinson and Fiona Burnett. Fiona is an animal nutritionist holding a Ph.D. in agriculture from Edinburgh University. Before coming to the Glenholm Centre she was employed by the Church of Scotland as a mission partner in Zambia where she worked as a lecturer in animal science. From 1988 to 1990 Fiona worked for the Chipembe Farm College 100 kilometres north of Zambia's capital Lusaka. In 1990 Fiona moved to the University of Zambia where she progressed from lecturer to head of the animal science department. While in Zambia Fiona was often called on to host visitors to the United Church of Zambia and her experience running an informal guest house there, together with her passion and talent for cookery leaves her well placed to manage the Glenholm Centre. Within the Centre Fiona is responsible for financial management, catering and keeping the sheep alive. Neil is a computer professional who after graduating from Exeter University with a degree in Geography and Mathematics, began work in 1982 for the Information Management sector of British Airways. He left British Airways in 1989 to go to Zambia as a volunteer with Voluntary Service Overseas (VSO). From 1989 to 1991 Neil worked for the Natural Resources Development College, an agricultural college in Lusaka, setting up a computer training centre there and computerising the college farm records. In 1992 he moved to the Computer Centre at the University of Zambia where he was involved in microcomputer support for the University and was closely involved in the development of electronic mail services for non-commercial organisations throughout the country. In 1994 Neil was involved in establishing Zambia's first full Internet service and in 1995 he moved to ZAMNET Communication Systems Ltd, the company set up by the University to manage and develop this service. Within the Centre Neil is responsible for computer training and marketing. Minty is a gentle friendly thing who'd rather lie down and have her hair brushed than get involved in any rough ball chasing games. Although if there are cars or sheep to be chased she's the first to get involved. 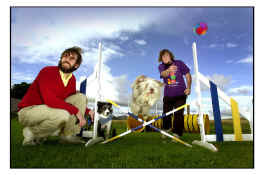 She is a black and white working bearded collie who was born in July 2005. 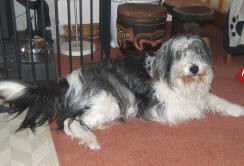 Sage is another bearded collie, unusually white aside from the tips of his ears and a tiny patch on his back. Born in August 2009, Sage is very shy and a little frightened of his own shadow. He loves his toys and going for walks, and tends to follow Minty in everything she does. We just hope that in time he'll learn that people are fun too.